Hybrid mixed martial arts (MMA) gloves have the basic MMA gloves features with a much thicker padding commonly associated with boxing gloves. Hybrid gloves are meant for sparring in MMA and not to hit pads or heavy bags on a regular basis. 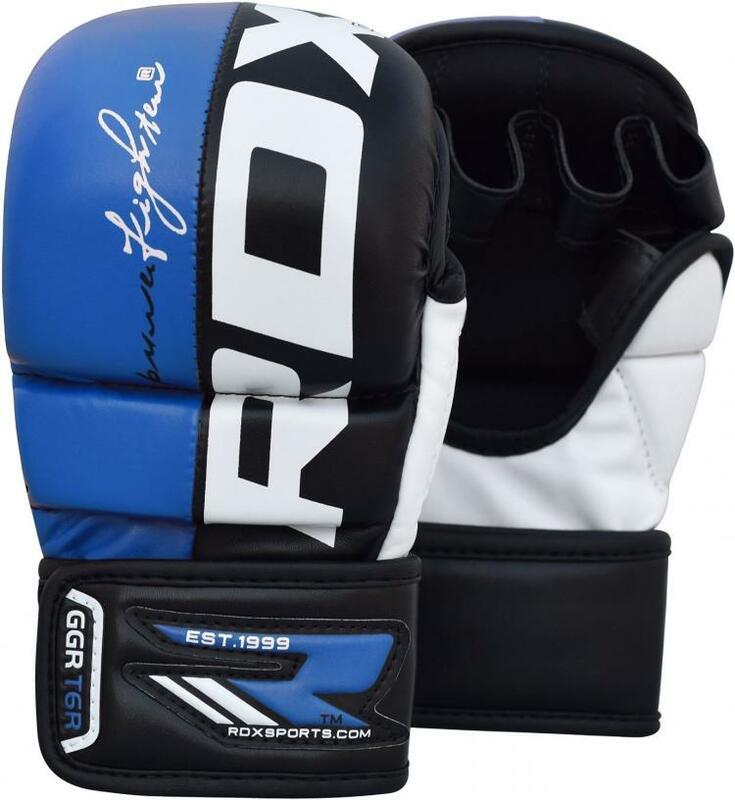 They are called hybrid MMA gloves because they are designed to serve grapplers and strikers equally well. These gloves are better equipped for high intensity ﻿﻿﻿﻿﻿﻿﻿﻿﻿MMA ﻿﻿﻿﻿﻿﻿sparring while reducing the damage absorbed by your hands and softens the overall impact taken by your training partner. One of the downsides of the thick knuckle padding is that it is more difficult to obtain specific grips during the grappling portion of MMA class. 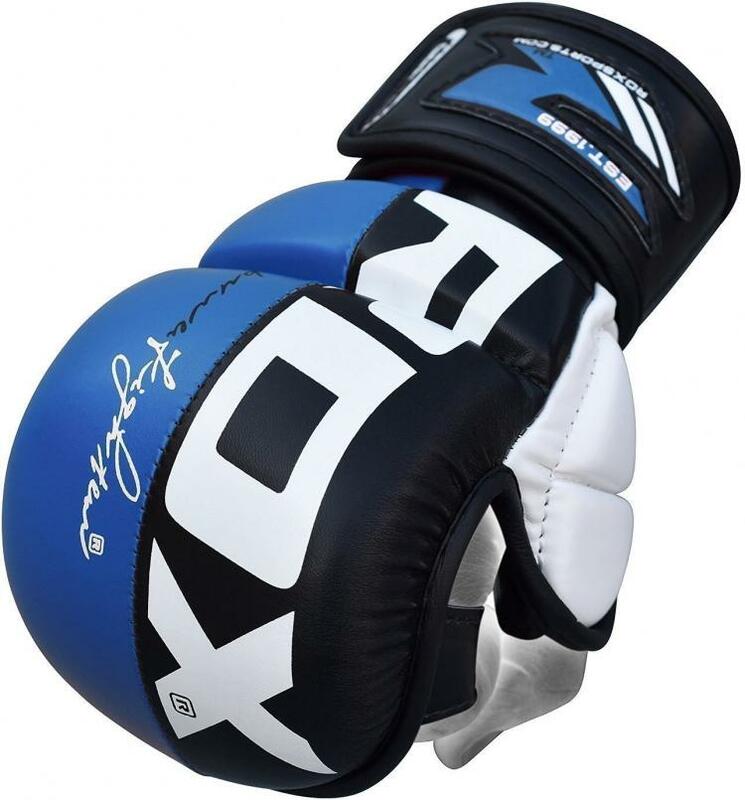 Listed below are 7 great choices for MMA enthusiasts looking to buy their first pair of MMA sparring gloves. Combat Sports developed their hybrid gloves to have 6 oz. padding for their regular to x-large size options, while its 2XL gloves have 7 oz. padding. 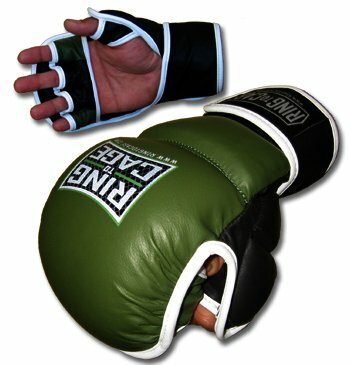 For the most part, the Combat Sports gloves have a simple clean look with an interesting wrist strap graphic design. This graphic portion looks like criss cross stitching running along the full length of the wrist straps. 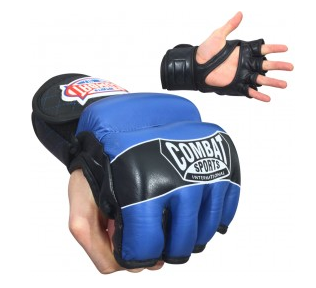 Combat Sports has thick and firm padding for the knuckles and back of the hand. The knuckle portion padding is segmented. This feature provides a slightly better finger mobility and its combination with the glove’s open thumb style gives it a good overall flexibility for grappling. Even though there is a good amount of padding given, this padding is not as protective as the other options on this list. Combat Sports designed this glove to have a full leather construction on the outside, which is easy to clean, and moisture wicking fabric for the interior. The inner fabric and open palm characteristic helps ventilate your hands during training. Another nice feature is how Combat Sports reinforced the edges of the thumb, palm and finger sections. This addition enhances the glove’s comfortability level. RDX hybrid training gloves have a cool appearance and is available in blue, red and yellow. These gloves exterior consists of Maya Hide leather, which is RDX’s own synthetic leather material. The interior consist of moisture wicking microfabric to draw sweat away. Thick padding is present to protect the hands and knuckles. The knuckle section has three layer of padding with a gel technology included to improve dispersion of the brunt force and increase the hybrid glove’s overall protective properties. The RDX gloves has a two piece thumb padding, which makes it easier to bend the thumb. To secure this training gloves to a user’s hand, there are leather finger loops and an extra long wrist strap. 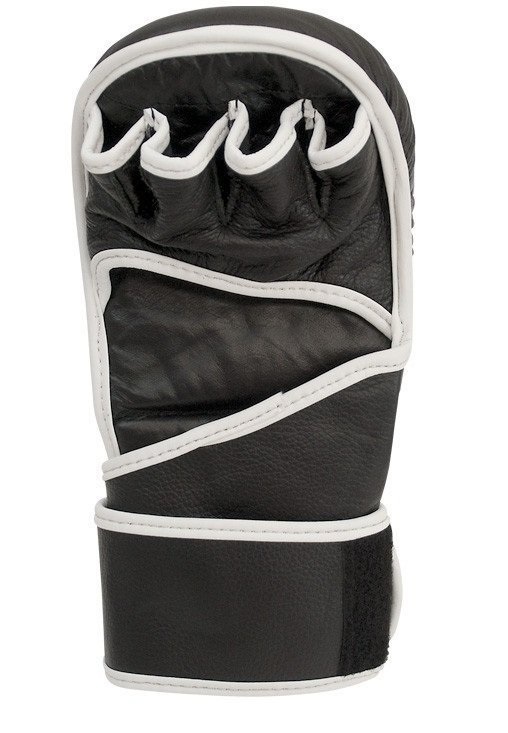 The leather finger loops and the open palm design maximizes the ventilation level and is great for gripping and grappling. However, the finger straps can dig into the finger a bit and can provide discomfort as you attempt to form a fist. You will get used to it eventually and the edges will soften over time. The long wrist strap is designed to be able to wraparound the user’s wrist twice. This characteristic is optimal for obtaining a secure fit and acts as additional wrist support as well. The 7 oz. 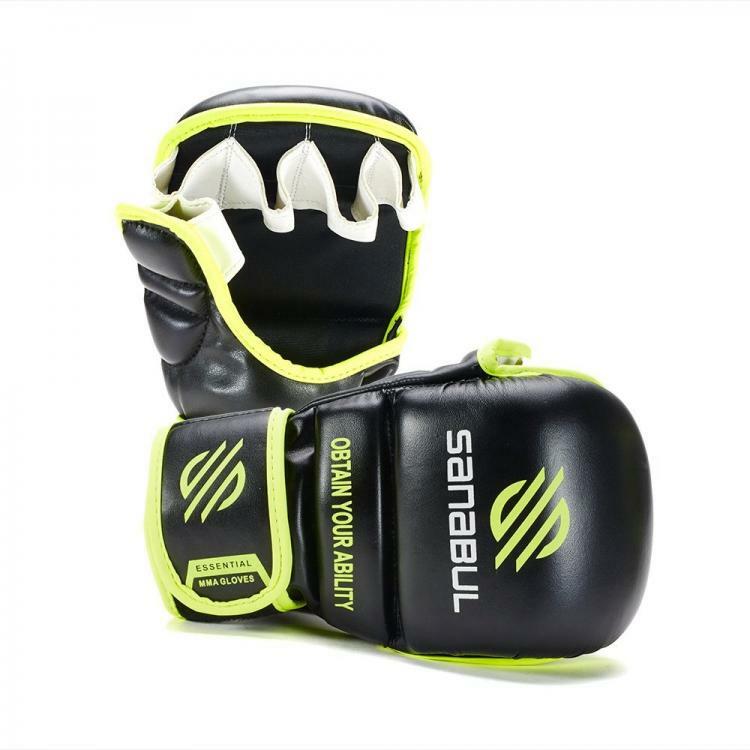 MMA sparring gloves from Sanabul is constructed from engineered synthetic leather. Similar to the RDX training gloves, Sanabul’s MMA gloves has long wrist straps that is designed to wrap around the wrist multiple times. A single long strip of leather is stitched onto the gloves and acts as the finger loops. This leather strip is tapered so that the it is short on the underside of the finger, while the portion between the finger is wide to provide a larger surface for stitching. The latter feature reduces the chance of the finger loops detaching from the glove. Unfortunately, Sanabul did not reinforced the edges of their glove’s finger and thumb loop. A unique feature offered by the Sanabul glove is its segmented thumb padding for improved thumb mobility. Sanabul’s hybrid gloves have approximately 1 inch thick padding for its knuckles. Their padding is soft, yet durable and pre-curved to make it easier to form a fist. The padding’s shock absorption ability is mediocre when compared to the gloves on this list. On the other hand, the Sanabul gloves are extremely budget friendly and you get what you pay for in terms of its padding. The Ikusa hybrid gloves is one of the many MMA gloves sold by Hayabusa. It is only available with the color scheme shown above. The Ikusa exterior is composed of Hayabusa’s own synthetic leather material they named Vylar leather. 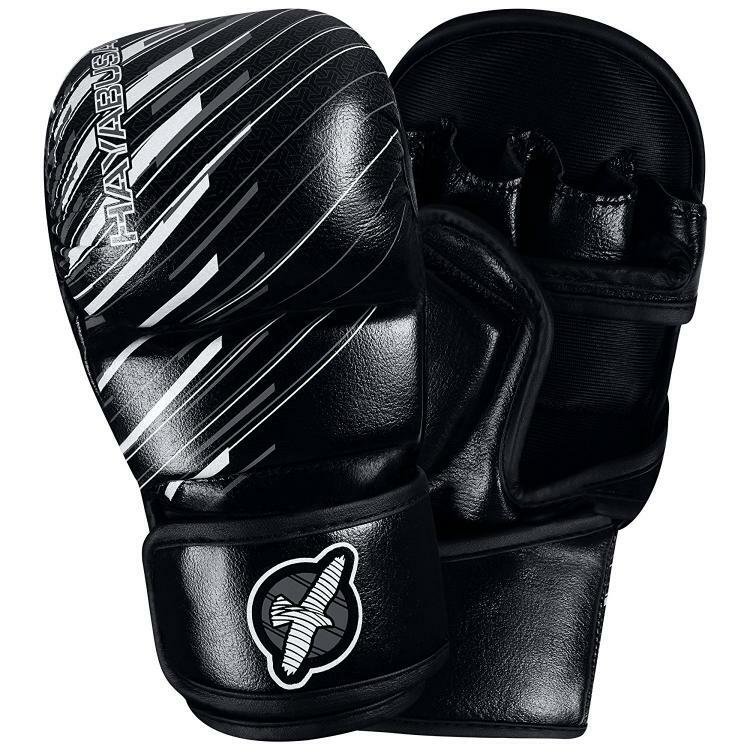 Hayabusa helps make the Ikusa gloves stand out by adding the white and gray stripes and color scheme to contrast with the glove’s black leather. The Ikusa has thick contoured padding for the knuckles as well as solid padding for the back of the hand and thumb. The contoured padding keeps the gloves in a natural curvature and provides an ergonomic advantage for forming a fist. Hayabusa also increased the comfort level of the Ikusa and control by extending its finger loops to cover the upper portion of the palm as well. The palm section of the Ikusa has reinforced edges, but this element is not extended to the upper edges of the thumb and finger loops. Despite being one of the more expensive gloves on this list, Ikusa is highly comfortable, protective and can be enjoyed by MMA practitioners with various expertise levels. Ring to Cage’s 6 oz. hybrid gloves has 2 inch thick knuckle padding that is great for your fist and will also be appreciated by your training partner. In addition to its back of the hand padding is the thumb padding that is broken into two large separate pieces for increased thumb mobility. The pre-curved knuckle padding is nice because it reduces the time and need for breaking it in. You can get the natural feel of the gloves right off the bat. Ring to Cage incorporated its glove with dual wrist straps that utilize a cross-directional hook and closure system.This wrist strap design may not be solely relied on for wrist support but it does give the gloves a secure fit. Unlike some of the other gloves with finger loops, Ring to Cage has theirs reinforced on the bottom and upper edges. 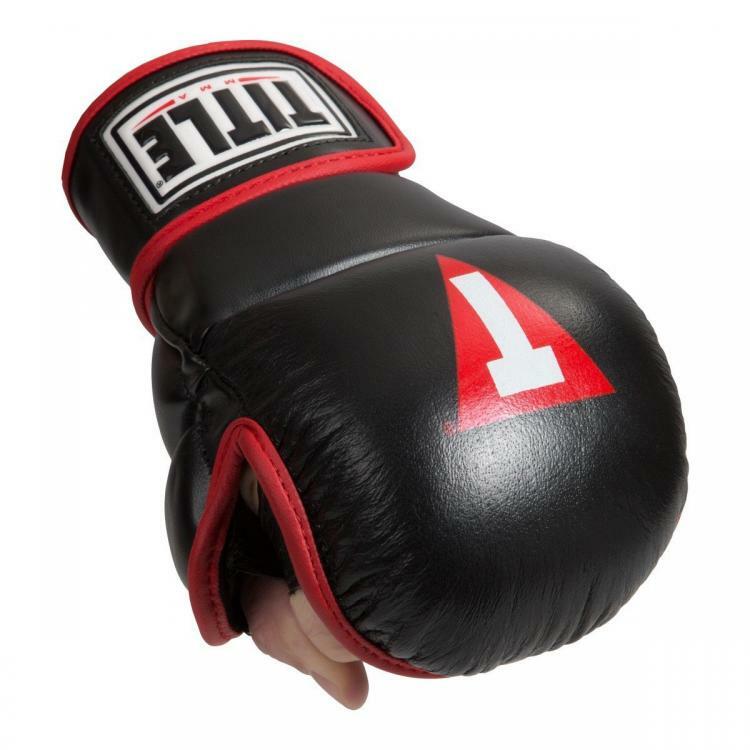 Despite only being available in black and green, its genuine leather exterior and knuckle padding makes the Ring to Cage glove a fantastic choice for new MMA practitioners. 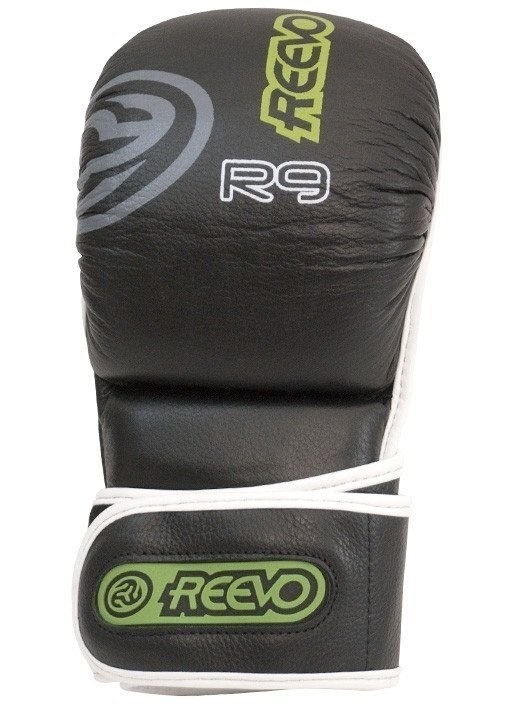 Reevo utilized premium leather to construct their R9 hybrid gloves. Their all leather construction means there is no fabric lining to draw the moisture from your skin. To make up for the lack of moisture wicking interior, the R9 has an open palm design for breathability. Furthermore, the benefit of not having a fabric interior is that it is easier to clean and your sweat will not be soak into the padding, which reduces the growth of odor causing bacteria. One of the R9’s best feature is how the finger loops extends to cover the top portion of a user’s palm. Additionally, all the finger loops and palm edges are reinforced and softened with a contrasting color leather. These features makes it easier and more comfortable to form a fist. It is nice that the R9 has their wrist wrap long enough to go around wrist twice. However, Reevo could improve their R9 gloves by increasing this wrist strap to be slightly longer. Otherwise, individuals with large wrists will find the current length will leave some of the Velcro region exposed. The knuckle padding for the R9 is slightly contoured and is decent in quality. The back of the hand padding is quite thin though. Reevo R9 should be recommended to individuals preferring their hybrid gloves on the lighter side. Title MMA hybrid gloves have a minimalistic physical appearance and is only sold in the color scheme shown above. To make up for it, Title has focused its effort towards building a pair of terrific hybrid sparring gloves that has 1.5 inches of pre-curved knuckle padding. The curvature of this glove is distinct and makes it easy for its user to form a fist. Moreover, it does not force the user to extend their fingers. This results in less finger jams and accidental eye pokes while training. Even among the open palm design, there’s no option more open than this Title Safe Spar gloves. Their open design is complemented with its leather finger and thumb loops. A negative aspect of the Title gloves is how it does not have reinforced edges to soften it. Therefore, it takes some time to get used to gripping with these Title gloves. The Title hybrid glove is a great choice that will improve the training safety for beginners.